How time flies! In 10 short years, we have grown our collection, hired three professional curators, recruited over 20 dedicated volunteers, and put on almost 25 exhibitions. The Craft Shop has seen an even longer history of creativity and has served as a bakery, craft shop, studio, apartments, salesroom, and more for over a century. If you have lived or worked in the Craft Shop, volunteered for the [Museum and] Archives Committee, or have other fun stories to tell about the museum, we want to hear from you. Please fill out the form below, and we will start collecting the wonderful stories that give this museum its depth. 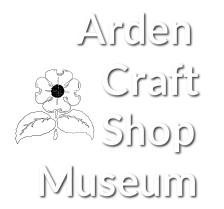 Please let us know what your association is with the Arden Archives, Craft Shop, or ACSM. Be sure to include dates with your anecdotes! We may have further questions for you, so please leave us your email and/or phone number so we can contact you. Thank you!